A tight match with our good competitor Minnamari resulted (once again) in an Over All Victory in in the ORC-classes in the Helsinki-Tallinna Race. Minnamari managed to beat us with less than a minute in sailed time, but on corrected time we got the best of her. Tiare finished third. The race was rather challenging with variable wind strengths and directions. Two calms were experienced, the first before Tallinna Madal and the second at Nygrund. 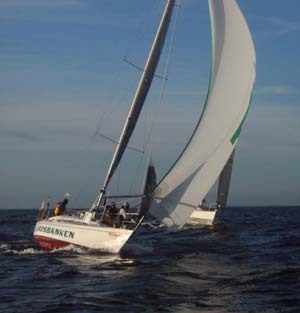 At the latter Minnamari approached us and we sailed very close to each another to the finish. At the end Minnamari succeeded in passing us, and was 46 seconds earlier over the finishing line. But she had to give 3 minutes in handicap. Our dear competitor Tom Finell with FinnFUN sailed in Business Lys class this time, so we did not get a fight with him.